The Milkweed Is very useful, although when forging please be respectful of the monarch butterfly. 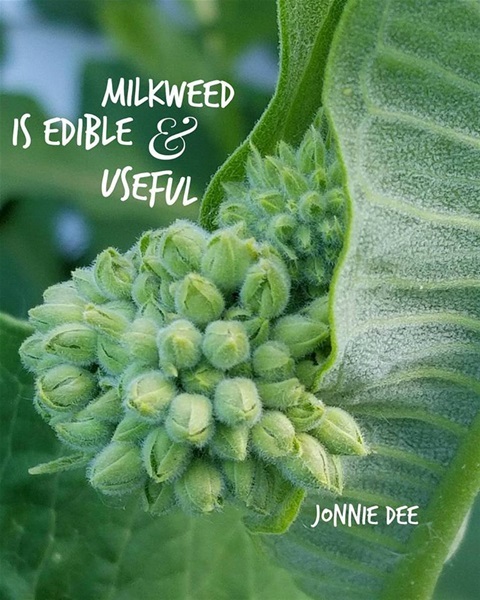 I only for forage the milkweed if there is an abundance of it. The monarch butterfly cannot survive with-out the milkweed . They only eat milkweed and need it to lay their eggs. The Monarch are pollinators too. I harvest the common milkweed, Asclepias syriaca. At this stage the flower heads can be eaten cooked, like broccoli. Later, the lovely and fragrant pink blossoms of the milk weed smell delightful when blooming. I have made a delicious jelly from them. Each year I learn more and more about the wonderment of milkweed. Some people have used the sap for wart removal. Keep the sap away from your eyes! As I often say, find an herb, study it, use it, love it, thank it, and share it. I am not prescribing, just sharing personal information.